Watching Woody Allen’s 47th film provides a peculiar sense of comfort – especially if you’ve seen the earlier 46. Does this reduce critical faculties? Not so much, more it puts you in a position to judge by comparison what is undoubtedly the most prolific and, in many ways, the most significant body of work in American cinema. We’ve known for many years now that Woody is way past the gag fests of the “early funny ones.” Now he moves between such semi-comic dramas as Blue jasmine ,occasionally hits a latter high like Midnight In Paris, sometimes coasts in a way that is more rewarding that others at their peak – witness this. 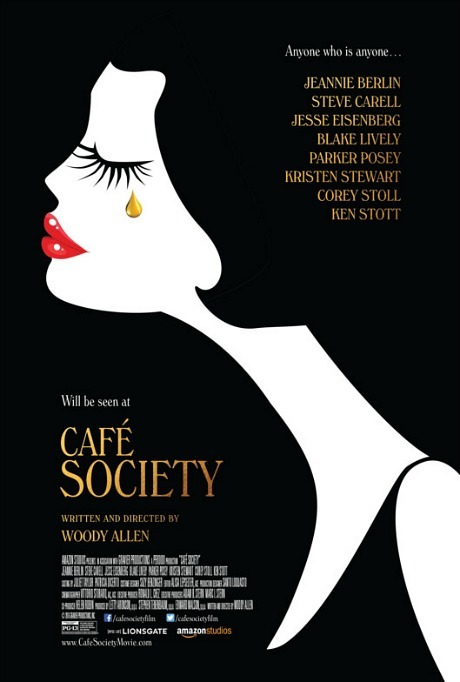 If Café Society is to be placed in the Allen’s oeuvre it echoes in many ways the heartfelt nostalgia of Radio Days, the gangster comedy of Bullets Over Broadway, and – unexpectedly – both the glamorisation of, and disappointment in, old-time Hollywood, that permeates The Purple Rose of Cairo, certainly one of the man’s top-three greatest works. One of the most interesting aspects of the movie is Allen’s own narration. A standard element in many of his movies, for the first time here he sounds like an old man in voice over, displaying the 80 years he now carries. At first this jars, feels slightly uncomfortable even. But, as the story reveals itself, it feels more and more appropriate. This is, after all, a tale of past times, and of loss. Yes, it’s funny, but it’s more about character and about looking back and, to a degree, regret. The old man telling this story of youth is highly appropriate here. As said youth, Jesse Eisenberg, who has been nothing but irritating since The Social Network (witness his appalling Lex Luthor) is superb here, initially playing a variation on the Woody (they’ve all done it – yes Cusack, yes Branagh, yes that bloke from American Pie) but as the film progresses he shows the same character as an slightly older man – and all the more rounded for it. The same must be said of Stewart, who continues to impress us that she might actually be a truly great actress – who between the film’s two acts (early in LA, later in NY) is beyond beguiling. What this movie does – possibly more than most recent Woodys –is display just what a rounded filmmaker Allen is. Want great performances from a top cast? Not only do you have Eisenberg and Stewart, but check out a never better Steve Carell, and Blake Lively who – after The Shallows earlier this summer – points out that she really may well be someone worth watching. Want to watch one or the world’s greatest cinematographers, Vittorio Storaro, light period LA like you wished you lived there and then reconfigure his palette to a more brutal but ultimately as beautiful New York? – here’s your film. And finally, why doesn’t Allen ever get commended for the way the man visually constructs a scene? Beautifully framed and often prone to long, sustained takes that, if Scorsese were doing them, would have people cheering from the rafters. But with Allen, you barely notice the technique. Which in itslef is the ultimate tribute. This isn’t Woody at his best – but (as we’ve said before) this is Woody still better than most. Bittersweet, heartfelt, a film made by a man looking back at a world he kind of eulogises, awash with the music he loves, the people he’d like to either know, or even have been, titled with a familiar font. Does personal cinema ever get more personal than this?